A book which I have read several times over the last 30 years - recommended by a much respected English teacher in my high school. Maybe one of the best 'road' stories, literally. In music we hear about some of this background in Woody Guthrie's songs, but this is raw and real. I'll put it back again on my 'to read' shelf. As I am Welsh, it really resonates. As a son of Newport myself, I am somewhat partial to Davies, and I was entertained and informed about social conditions in late 19th century America by his firsthand account of tramping around the country. Nevertheless, Davies's Edwardian prose and occasional humor make his experiences seem easier and more carefree than they clearly were. Worse, the book is marred by moments of appalling racism which seem out of character with the gentle tone of the rest of the work. 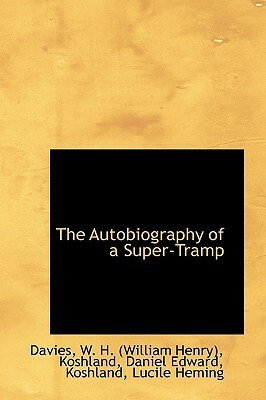 Davies was undoubtedly a man who marched to a different drummer, and as such his life and work are intriguing, but "Super-tramp" indulges prejudice in a manner that makes for an uneven and uncomfortable read. An early entry in the line of ne'er-d'ye-well starving artist autobiographies that continues with books like You Can't Win (Jack Black) and Junky (William S. Burroughs).This book is less interesting than those. It tells of an interesting life and interesting events and people, but not particularly evocatively. And it's salted with some wholly uninteresting anecdotes (like the landlord squabble he finishes the book with) and unintentional shaggy dog stories.Not a complete waste of time, but nothing to go out of your way for. This book has a dated feel to it because of the style of writing. While the author did indeed seem to go through some very interesting experiences, it does leave a reader of the modern age feeling like there was a lot missing - such as emotions, thoughts, descriptions. There is some dialogue, but it's mostly a relating of what happened without a tapestry of imagination that brings it to life. I felt really left out of the writer's inner thoughts, beyond how much money he was spending, especially when it came to where he lost his leg and was fitted with an artificial one. This was dealt with in no more or less attention than being mistaken for a murderer in one town or how much money it was to spend a night in a certain hostel. I had to make up a lot of the story in my head to fill in the blanks, but it was a very interesting tale of one man's journey through parts of the US and England. What it's about: The autobiography of poet W.H.Davies before he became famous. For much of the last years of the 19th Century he was a tramp, either by choice or latterly by circumstance. With a dispassionate voice given to seeing the good in almost everyone, he recounts ordinary and extraordinary events from this time.I found this work notable for its calm voice, which never seemed to get excited by any event or person. It made me work harder as a reader to understand who he was as a person. I enjoyed this voice, and the unique insight into a world that by its very nature meant that few genuine voices from it would ever be heard. I found it a little rambling in parts and should probably have treated it as something to be dipped into rather than read straight through as I did. The book is good if you want to learn about the life of a "tramp" or "hobo" during the late 19th century in Britain and North America. The people in this book are the what most people picture when they hear "hobo." They were the people with little tied-up bundles who would jump on trains and ride the rails. The story of this guy's life is moderately interesting. It's not action-packed, but it probably won't put you to sleep either. For me, there is no great wisdom or really even life lessons to be taken from this book. I would only recommend it to somebody who had a historical interest in what life was like for a hobo at that time. 2.5 starsThe book is quite gentle in style and doesn't really dwell on the deprivations that people in Davies' position must have found themselves. It was an interesting read but I'm afraid I didn't find it a patch on Orwell's 'Down and and Out in Paris and London'. However what really left a nasty taste in the mouth was the racism encountered in the chapter 'A Lynching' Firstly the incident in itself was execrable, but Davies makes some sickening comments of his own. After this I just could not enjoy the rest of the book. This is a fantastic and rare read. How many tramps from the late 19th century / early 20th century wrote books to give you a vivid picture of what it was like to be a tramp then? Not an outsider romanticizing it or trying to make it sound pitiable. This is the only one I know of. I love credible glimpses of other worlds and other times. Not my usual cup of tea, but nonetheless diverting. Comedic, sad, inspiring and yet awkward to read. Beautifully written in places, spasmodic and clumsy in others. My brother bought this book for 70p then gave it to me on a whim. Read three years later and I'm so glad it did. Funny, blasé, touching and original. Very good book when it comes to looking at the life of a person and why the picked the life they did. I was amazed at the way he was able to adapt in life. Did think it was a little more of a dry read then what i normally would pick. I am glade I read it though just to give perspective into another persons life and their experiences . Very easy to read but lacks something. The best line in it for me was when one of the fellow guests says that he cannot tell the difference between a curate and a vicar except that the vicar is fatter with a redder nose. It also has a number of scenes which these days are highly incorrect politically speaking and so it should be read as quickly as possible before history is 'adjusted' . The book was interesting to me. A side of life I don't get to see usual. Davies offered what seems to be an honest look of how he happened into becoming a tramp and eventually work to make his life better. I persisted, but this is another book that could have been much shorter and sharper. What I most enjoyed about this autobiography was its measured style suggestive of a mind concerned to weigh up experience carefully and justly. Davies writes in his last two paragraphs: "Perhaps I am deceived as to the worth or worthlessness of certain people, but I have given my experience of them without exaggeration, describing as near as memory makes it possible, things exactly as they occurred. I have made no effort to conceal my gratitude for those who have befriended me, and I have made every effort to conceal bitterness against enemies. If I have not succeeded in the latter it is with regret, but if I have failed in the former, for that I am more truly and deeply sorry... if I have not omitted to mention trouble of my own making, for which no one but myself was to blame, why should I omit the mention of others, whom I blame for hours more bitter? "Above all, I felt Davies gave the impression of himself as a man aware of how best to get on with people and how to bear your own self-imposed hardships on occasions when the liberty of the road becomes hard. Much of the narrative is understated, in particular the moment when the accident on the railway leads to his leg being amputated. For me, this absence of histrionics renders the narrative more convincing. Davies is at his most animated when recording the workings of the Charity Organisation which had to decide whether he was a worthy cause for them to recommend to their list of 'subscribers' - he has not a single good word to say for them, but his assessment of them is so evenly delivered that we end up unable to deny his opinion.A remarkable man, I think, and though it is easy to judge his life as an idler and one whose company was among beggars more practised than himself, his inclination to do a good day's work rather than be entirely dependent on the conned charity of others, usually vicariously enjoyed, left me feeling that he was for the most part not a wilful burden on society. And his impulse towards books and writing when a poor man is remarkable. However, we should not forget the foresight and sensible generosity of his grandmother's legacy of a weekly allowance, for it was that which perhaps enabled him to retain his status as a gentleman, rather than a ne'erdowell, of the road.There is one serious blemish in the text. Balanced as much of his writing is, there is no denying that, in this book at least, Davies was a racist, judging by his account of a lynching. When I taught 'To Kill a Mockingbird', pupils always found the use of the 'n' word shocking. Davies' coolness about Southern racist attitudes is equally shocking and disturbing. I enjoyed the breezy read of this book and Davies' technique brought the protagonist and narrator to life. We learn about his early life and his aspirations of becoming a writer, all told with a tone of contentment.We follow him as he chooses to depart his life in England for a nomadic existence trekking through North America. While the travels and character's musings on his life are amusing and pleasurable to read, there is nothing shocking or revolutionary in these writings. With the character's literary leanings, I thought the book would develop into something like Hamsun's 'Hunger' but the narrator doesn't come across as desperate or mad. Indeed, the book doesn't develop at all, it stays on one level. Even when different continents are explored, the narrator doesn't describe them with giddy thrill, he just gets on with things. Maybe that's all one can do when living life as a super tramp. Surroundings are probably unimportant. In fact, it's difficult to determine just what the character's aims are or what the novel is trying to achieve. Throughout the book, I tried to look for a philosophy or bigger meaning to the ramblings. I think I may have found it though where the protagonist states: 'I scorn clothes and jewellery; I would rather take a free country walk...than ride in a yacht or a coach'. The novel seems to be a bible into pursuing freedom and refraining from possessions, making your life interesting by taking risks. But I'm clutching at straws here.Then again, maybe we're not meant to look deeper. Maybe we should take it on face value and take pleasure in learning the structure of a vagrant's life.If you're looking for a novel with a life changing epiphany or hidden metaphors then skip this one. But if you're looking for an enjoyable and quick read, give this a whirl. My husband often mentioned how much he enjoyed reading this book when he was a kid. So when he bought an old copy (from the thirties, I think) I decided to read it too. I struggled a little with the first chapter, but after that found myself thoroughly engrossed, though I couldn't help being reminded of the movie Emperor of the North. I was also glad I didn't read the preface by George Bernard Shaw until after reading the book because it would have ruined one of the major scenes. (And now I need to be careful so as not to produce a "spoiler" for people who still haven't read the book.) In his preface Bernard Shaw comments on how he'd have started this part of the book telling readers they were about to read something that changed the whole course of the writer's life, but that Davies, instead, wrote the episode so matter-of-factly it was all the more chilling. Bernard Shaw was right. Davies was a self-taught writer (and poet, famous mostly for his little ode "What is this life if, full of care"). In his days writers didn't take courses on how to plot a book, how to develop characters, etc.—all those things that seem designed specifically to encourage self-doubt and writer's block. His work is possibly all the better for it. I can no longer remember the date I read this book; Ive just taken a stab at it. Probably one of my favourite books. I acquired it from school, along with two others, The Oxford Book of 20th Century Verse and John Wyndham's The Day of the Triffids - these weren't earned as any academic award, I left school finally by the side entrance and just neglected to give them back. I reckon the school owed me something and, hey, these books got me reading literature of my own volition.As a youngster, I thought this was the best, real-life, ripping adventure story; one man, albeit a ''bum'', against the world. I loved the romantic idea of freely hopping on and off passing freight trains, avoiding the law and its often brutal officials, and exploring the vast North American continent. However, when I reread it decades later I actually believe I got more from it, especially the later chapters concerning poverty, the poor laws and the conditional idea of charity in late 19th century England. And this guy who I thought was a ''bum'' was really a famous poet - ''What is this life if, full of care, We have no time to stand and stare?'' which could easily be my personal motto.Highly recommended. An odd book in many ways. Davies narrates in a dispassionate way. You get a good sense of the larger than life characters he encounters, but I found myself constantly wondering about Davies himself - what sort of person was he? After all, he must have been a larger than life personality himself to meet these people and have these adventures.This uncertainty about Davies is thrown into stark relief, when he narrates a lynching with a particularly racist bias. Now, it was a long time ago, there might be a cultural relativity argument here - but this wasn't just a casual racism, it quite specifically talks about a 'less intelligent race'. I think ultimately this chapter illuminates the central problem I had with the book, and that is Davies himself. I loved his stories, I loved the characters and the mayhem and the sense of cameraderie, but I never really took to Davies as narrator. The book was interesting insofar as it gives an insight into a way of life that no longer really exists. However, I was not sure why Davies ever became a tramp at all, seeing as he had a small income and the ability to work (before the accident). Some of his actions seemed foolish such as spending money on getting his poems published and then burning all the copies. The lifestyle, although interesting, seems a little indulgent, as though he was on a gap year before such things existed. He could have avoided being a tramp and so in places I got rather frustrated with him. In any case, it was an all right read. Road trip de William Henry Davies en su periplo como vagabundo por el nuevo mundo y posteriormente por el viejo. Costumbres sociales, corrupción, solidaridad, robos... Nuestro protagonista vivirá y padecerá de todo un poco. De gran relevancia, el contraste entre la caridad en el nuevo mundo y el viejo. Especialmente en su idílica etapa canadiense.Un gran diario y una magnífica novela costumbrista. I was at 3.5 stars, but the introduction (which I read last) put me over the top. The book is an interesting look at the US in the late 1800s through the eyes of one of the original beatniks. While Davies cleans up his wanderings compared to the sloshing style of Kerouac, you still get a sense of the freedom and spontaneity which links the two authors. It was alright, a bit slow though, and the turn of the century language was dry. However it is unique to see what the US was like in those times and how many other tramps were milling about day by day. Curious also to learn the different types of begging. I have no plans to ride the rails anytime soon. I like stories of simple, every-day life. Mr. Davies was a tramp, hobo, or bum in both the United States and Great Britain, and he tells about it in this book. Along the way he discovers that he has a knack for writing and puts out this book. He tells the story of the great difficulty he had in publishing it and getting it noticed. Great reading. Didn't quite finish it. Somewhat enjoyable narrative of and by an early 20th century hobo who is happiest wandering country roads and reading books in front of fireplaces in libraries. Wanted to like it better as I have a lot in common with the author. None-the-less interesting for getting a first hand picture of what hobo life was like then. A lovely book. I think somewhere in it he and another gentleman of the road walked from one town to another by country(ish) roads and all the while Davies recited poetry. (Maybe it was in the time when they wandered from spike to spike getting digs there, so they couldn't outstay their welcome?). Know the footsore feeling well. May the road rise up to meet you! A wonderful book, to be taken with a pinch of salt. It describes a bygone era of America and Britain. It has a wonderful cast of characters and is humorous. Worth reading for the exploits a man who choses to be a tramp. W.H. Davies - William Henry Davies was born in Newport, Monmouthshire, Wales. His father was, at the time a Publican. After an apprenticeship as a picture-frame maker and a series of labouring jobs, he travelled to America, first to New York and then to the Klondike.He returned to England after an accident whilst jumping a train in Canada, he lost a foot. Upon his return to Britain he led a poor, hard life living in London lodging houses and as a pedlar in the country. He married in 1923, Emma, who was much younger than he. His first poems were published when he was 34.Most of his poetry is on the subject of nature or life on the road and exhibits a natural simple, earthy style. He also wrote two novels and autobiographical works, his best known being Autobiography of a Super-TrampHe died in 1940.